An incredible collaboration with the Cranbrook Quilter’s Guild has resulted in a very unique ‘wrap yourself in happiness’ raffle prize that will raise funds and awareness for local arts & culture in Cranbrook. The few remaining unsold 2018 ‘PEAK FREAK’ festival T-Shirts were given to the CQG and they creatively transformed them into a striking full sized quilt for the GRAND PRIZE. In this way, the shirts, originally donated by Sidekick Stickers, are recycled & continue to support local artists. On January 8, 2019 Cranbrook Quilter’s Guild ladies present custom quilt to FPPAS Directors Maureen Frank (centre right) and Howie Mason (top centre). The CQG meet regularly at the Cranbrook Senior’s Hall “providing information and inspiration to Cranbrook’s quilters”. They began in 1984 by a group of 16 local quilters inspired by another city’s guild and have a current membership of 68. Three of the founding women are still members today. 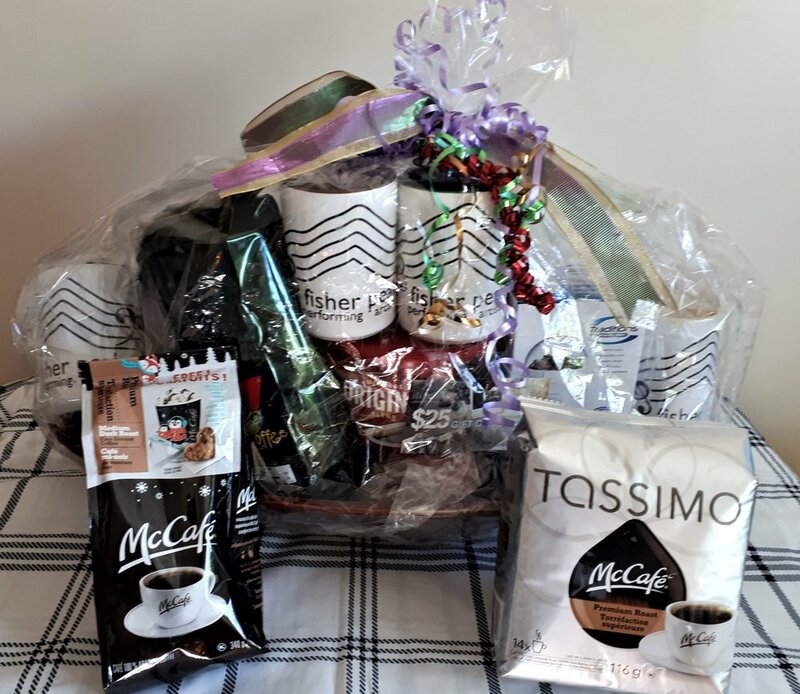 The second prize is a ‘Coffee Lover’s Gift Pack’ that contains four custom-made coffee mugs from Cranbrook Photo, stuffed full of coffee samples from Kootenay Roasting Company, Tim Hortons, and McDonalds with Gift Certificates from Hot Shots Café and coffee tools from Canadian Tire. Our deep gratitude to these businesses for investing in our community! 2nd Prize contains: 4 custom mugs from Cranbrook Photo, Coffee from Tim Hortons and Kootenay Roasting Company, coffee grinder and press from Canadian Tire, 25$ Gift Certificate from Hot Shots, coffee + coffee pods + coffee coupons from McDonalds. Watch for ticket sales at the FPPAS booth this summer every Saturday of July & August. Only $2 per ticket - draw will take place at Rotary Park on Saturday August 31st during the 2nd annual ‘PEAK’ Music Festival! Everyone wins when we sell all 2500 tickets to raise $5000 for FPPAS programs. Win an instant prize each Saturday of Summer Sounds/Dancing in the Park! For every $2 raffle ticket purchased at Rotary Park you’ll get a FREE entry to win an instant prize drawn at approximately 8pm. Must be at least 18 years old and present to win. Our deep appreciation goes to all the above businesses who have partnered with us this year.